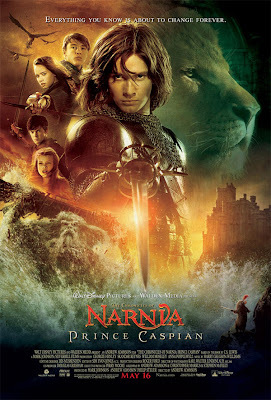 The Chronicles of Narnia: Prince Caspian is the sequel to The Chronicles of Narnia: The Lion, the Witch and the Wardrobe. The four children who discovered the magical world of Narnia in the first film find themselves magically transported back to the world they had left behind a year ago. All has changed however as 1300 years in Narnia has passed. What used to be a magical land is now a ruin. Narnians are thought to be extinct and the land is ruled by a human race known as the Telmarines. What purpose has Peter (William Moseley), Susan (Anna Popplewell), Edmund (Skandar Keynes) and Lucy (Georgie Henley) then? The movie began with the telling of Prince Caspian (Ben Barnes) escaping death from a murder attempt from his uncle, Miraz (Sergio Castellitto) who wants only the throne for his newly born son. Fleeing into the woods with the possession of a magical horn in hand, Prince Caspian was forced to blow the horn in desperation as his perpetrators closed down on him. It is this summoning by the horn that brought the four children back to Narnia, the land where they were Kings and Queens. Their adventure this time would be to help Prince Caspian regain his rightful throne from Miraz and to return the Narnians their land. Not having watched the first film and without any knowledge of the characters, it was a little confusing at the start to piece out what was happening. Prior to stepping into the cinema I had also lowered my expectation of what I was going to see. This is because the trailer did not leave much to be desired from it and it didn’t prove me wrong. The story itself has moved away from magic and wonder. The Narnians were forced away by the Telmarines. Talking animals and dancing trees are no longer found in a Telmarine ruled land. And this is what the film is about, to bring back the magic of Narnia. Going at almost two and a half hours long, the first half of the film was quite slow in pace. There wasn’t any screen magic and much action to liven things up as the characters was literally just warming up to each other. Prince Caspian discovered the Narnians, the Narnians were reuniting and the four children acquaint with Prince Caspian and the Narnians. It was not until the battle scenes that things looked up and time flew quickly by. Despite some tolerable blandness in the film, there were two characters that really stood out. The sword wielding mouse knight, Reepicheep (voiced by Eddie Izzard) is all so cute as Lucy the other outstanding one so enthusiastically pointed out. Reepicheep is as charming as he is adorable with his skillful swordsmanship and bravery stealing every scene he appears in. He is proof that greatness can come in small packages. Lucy on the other hand wins hearts with her innocence and belief. Her faith in finding Aslan (voiced by Liam Neeson) is an inspiration to all who has lost hope. Towards the end of the film, Peter and Susan would also learn their lessons of ego and love as Aslan puts it. But it is an aspect that you’ll need to observe closely to see the underlying message. All in all The Chronicles of Narnia: Prince Caspian is a watchable film both for the younger audience as well as the adults. I’ll be looking forward to see more of Reepicheep and Lucy when I get summoned back to Narnia in 2010 for The Chronicles of Narnia: The Voyager of the Dawn Treader. Well, I just saw this last night. Its really one of my favorite movies. A great movie with great characters & storyline. My favorite moment came in a scene toward the end, when Prince Caspian had his evil uncle at sword point, with both characters talking in their Spanish accents. So wanna watch this now then go ahead and Download Free The Chronicles of Narnia: Prince Caspian Movie.